We’d love your help. Let us know what’s wrong with this preview of Playing with Dynamite by Sharon Harrigan. Sharon Harrigan’s father was larger than life, a brilliant but troubled man who blew off his hand with dynamite before she was born and died in a mysterious and bizarre accident when she was seven. The story of his death never made sense. How did he really die? And why was she so sure that asking would be dangerous? A series of events compel her to find the answers, collec Sharon Harrigan’s father was larger than life, a brilliant but troubled man who blew off his hand with dynamite before she was born and died in a mysterious and bizarre accident when she was seven. The story of his death never made sense. How did he really die? And why was she so sure that asking would be dangerous? A series of events compel her to find the answers, collecting other people’s memories and uncovering her own. Her two-year odyssey takes her from Virginia to Detroit to Paris and finally to the wilds of northern Michigan where her father died. There, she discovers the real danger and has to confront her fear. Playing with Dynamite is about the family secrets that can distance us from each other and the honesty that can bring us closer. It’s about a daughter who goes looking for her father but finds her mother instead. It’s about memory and truth, grieving and growing, and what it means to go home again. To ask other readers questions about Playing with Dynamite, please sign up. The email causes her to question her own memories of the father who had died decades earlier and she set forth on a fact-finding journey in the fall of 2013 from her home in Virginia back to Detroit and northern Michigan where she grew up. Informed by interviews with those who knew her father best, the memoir expertly weaves Harrigan’s own life story with memories shared by her family. And in the process of learning more about her dad, Harrigan comes to more fully know herself and other members of her family. “If we want to find out anything, we have to ask,” Harrigan writes, and so she does. Her mother, brother, sister, and uncle contribute countless tales—many of which are astonishing—to clear the air and breathe life into a ghost. The stories of how he met her mother, of how he would treat his children—including Harrigan herself—of his intense work ethic and intellectual curiosity are colorful and insightful but shift or change depending on the teller. If there is one definite Harrigan learns, it is that truth is subjective. Facts, Harrigan discovers through her quest, don’t often fit the picture she had assembled. “I don’t know anything,” she says to her uncle regarding events he believed were common knowledge to the family. So much of her father’s life and character were misremembered, completely unknown, or perhaps even intentionally forgotten. Partial truths and imagined truths make completely knowing someone a challenge, if not impossible. More so when that person lives on only through memories and photographs, as is the case with Harrigan’s father. Harrigan’s journey is beautiful, emotional. “I went looking for my father. And found my mother instead,” she writes. he discovers the significance of her mother’s “room of one’s own” at the local Y, of the reservations her mother felt in marrying her father, and of the challenges she endured through that marriage. There are the stories we tell ourselves about our lives and the stories we discover if we’re brave enough to ask questions. This is the journey Sharon Harrigan takes in her memoir Playing with Dynamite. Structured like the Odyssey, a book her brother read to her as a child, Sharon’s quest begins as a search for her father –a man who died when she was only seven. A man who is both mythos (a superhuman one-armed welder who can drive with no hands), and absent memory. Along the way Sharon discovers There are the stories we tell ourselves about our lives and the stories we discover if we’re brave enough to ask questions. This is the journey Sharon Harrigan takes in her memoir Playing with Dynamite. Structured like the Odyssey, a book her brother read to her as a child, Sharon’s quest begins as a search for her father –a man who died when she was only seven. A man who is both mythos (a superhuman one-armed welder who can drive with no hands), and absent memory. Along the way Sharon discovers why her family hates police and the FBI, how her father blew off his hand with a stick of dynamite, and what really happened on the night of his death. But more importantly, she comes to realize the influence of DNA on personality and how children repeat the paths of their parents even when they don’t know them. With each revelation, distance between family members shrinks as a family narrative is shaped from the disparate memories of relatives who live miles apart. Sharon deftly handles both time and the portrayal of salt-of the-earth family members whose lives are gritty and tough. She treats her characters with compassion and doesn’t let herself off the hook as she searches for the truth. Her prose is beautiful, lyrical, and confident. 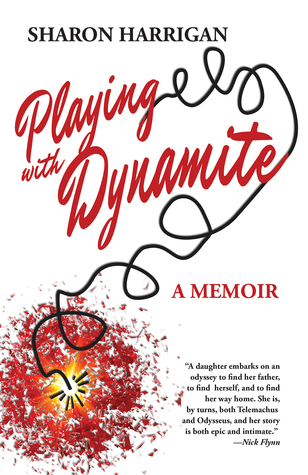 If you want to read or write memoir with heart and compassion, read Playing with Dynamite. If you want to understand how time and place influence the lives we live and the legacies that follow, read this book. If you want to reclaim a lost family member and need a map to follow, read this book. If you want to take a journey that will make you laugh and cry as you glide along beautifully crafted sentences, read this book. In other words, just read this book. Sharon finds herself embarassed to be left with only the word, "Wow", in response to her Uncle's revelations. That's how I feel about the book which just plowed into my day. Wow. When my father took my six-year-old sister on a trip to kill a deer, the deer killed him. They were still winding their way Up North, driving the four-hour trip from suburban Detroit to the country. In the pre-dawn fog, a buck ran into the middle of the road, the soft-top Jeep crashed, turned upside down, and crushed my father. My sister survived, and my mother was left to care for three small, bewildered children on her own. My brother was nine, I was seven. My father was thirty-two, my mother When my father took my six-year-old sister on a trip to kill a deer, the deer killed him. They were still winding their way Up North, driving the four-hour trip from suburban Detroit to the country. In the pre-dawn fog, a buck ran into the middle of the road, the soft-top Jeep crashed, turned upside down, and crushed my father. My sister survived, and my mother was left to care for three small, bewildered children on her own. My brother was nine, I was seven. My father was thirty-two, my mother twenty-nine. The year was 1974. How accurate are our childhood memories? What happens when family secrets are kept for decades? Sharon Harrigan, in her journey to find answers, manages to heal herself, help her own children with their struggles, and write a deeply touching memoir. At age 7 and one of 3 young siblings, Sharon loses her father in a car accident. As a teenager, her father was literally "playing with dynamite" and lost his right arm. Sharon fears she's playing with dynamite as she seeks the truth about her father's How accurate are our childhood memories? What happens when family secrets are kept for decades? At age 7 and one of 3 young siblings, Sharon loses her father in a car accident. As a teenager, her father was literally "playing with dynamite" and lost his right arm. Sharon fears she's playing with dynamite as she seeks the truth about her father's past, her parents' marriage and her own self discovery. She defines playing with dynamite as "digging up the past, exposing family secrets to the world. Writing this book." At the beginning of the book, she says that when she does readings from her memoir, people approach her afterwards to talk about their own families instead of talking about her book. From the start, there was so much I could relate to as I grew up in the 60's and 70's. My father was also described as "a man of that time" and that "things were different back then." Cautious. If there is one thing having a father who lost his hand to a stick of dynamite and later dies in a car crash teaches you, it's to be cautious. Cautious not to ask the wrong questions. Cautious not to upset your family. And to shrink away from attention as a preventive, cautious measure. Through the arc of the memoir, Harrigan grows as a character, away from caution, but still attracted to those who crave it - like her ex-husband. By the end she completes her Odyssey, finding ways to br Cautious. If there is one thing having a father who lost his hand to a stick of dynamite and later dies in a car crash teaches you, it's to be cautious. Cautious not to ask the wrong questions. Cautious not to upset your family. And to shrink away from attention as a preventive, cautious measure. Through the arc of the memoir, Harrigan grows as a character, away from caution, but still attracted to those who crave it - like her ex-husband. By the end she completes her Odyssey, finding ways to break free from caution toward a more authentic self, based in the truth of what happened to her father. Sharon Harrigan's father died in an accident when she was in grade school. He was on his way to hunt deer, and a deer ran in front of his jeep, causing a wreck. That's what she believed. I loved this memoir about the author's quest to know more about her father, to locate the real person in her hazy memories and her relatives' larger-than-life tales. She beautifully evokes how absence and silence shape families, and how we can unintentionally repeat destructive patterns. She als Sharon Harrigan's father died in an accident when she was in grade school. He was on his way to hunt deer, and a deer ran in front of his jeep, causing a wreck. That's what she believed. She also captures what it's like to be a smart kid from a poor place. Even when you achieve your dreams, you may struggle with impostor syndrome in your new world and regret that you've somehow abandoned those you grew up with. Dynamite is a loving tribute to Michigan and all its beauty and struggles. *I received a review copy of this book. Why don’t we ask questions of family members? Because the answers might kill the stories we tell ourselves. Because the answers might blow up the images we’ve created. Because the answers might make us older and wiser. Playing with Dynamite is Sharon Harrigan’s Odyssey to discover her father who died in a car accident when she was seven. During her journey, Sharon discovers new sides to her father and mother, other family members, and herself. Prompted by the burning curiosity about the father she barely knew, Sharon Harrigan takes us on a journey that leads to the unearthing/shattering of one family myth, only to be recreated into a stunning narrative—not just about her father—but also about, among other discoveries, the resilience and spirit she recognizes within herself. Playing with Dynamite is written with eloquence, grace and generosity. I highly recommend it! Compelling memoir about the author's journey to understand the creation of the mythology she and other family members had built around her father and his early death. Highlights the way in which memory is fallible, often shaped by individual perspective, and can become collective. At heart, Harrigan explores the way in which we create stories about our family in order to form our own identities. From a single human quest to "find the father", Playing with Dynamite showed me what we all have in common. It opened a window into the world of a part of the US that I don't normally have access to. Some interesting revelations spread thinly through an otherwise unremarkable memoir. Would have benefitted from a very thorough edit.